Abstract: How can we create technologies to help us reflect on and change our behavior, improve our health and overall wellbeing both at work and at home? In this talk, I will briefly describe the last several years of work our research team has been doing in this area. We have developed wearable technology to help families manage tense situations with their children, mobile phone-based applications for handling stress and depression, as well as logging tools that can help you stay focused or recommend good times to take a break at work. The overarching goal in all of this research is to develop tools that adapt to the user so that they can maximize their productivity and improve their health and happiness. Abstract: Through deep learning, deep neural networks have produced state-of-the-art results in a number of different areas of machine learning, including computer vision, natural language processing, robotics and reinforcement learning. I will summarize three projects on better understanding deep neural networks and improving their performance. First I will describe our sustained effort to study how much deep neural networks know about the images they classify. Our team initially showed that deep neural networks are "easily fooled," meaning they will declare with near certainty that completely unrecognizable images are everyday objects. These results suggested that deep neural networks do not truly understand the objects they classify. However, our subsequent results reveal that, when augmented with powerful priors, deep neural networks actually have a surprisingly deep understanding of objects, which also enables them to be incredibly effective generative models that can produce a wide diversity of photo-realistic images. Second, I will summarize our Nature paper on learning algorithms that enable robots, after being damaged, to adapt in 1-2 minutes in order to continue performing their mission. This work combines a novel stochastic optimization algorithm with Bayesian optimization to produce state-of-the-art robot damage recovery. Third, I will describe our recent Go-Explore algorithm, which dramatically improves the ability of deep reinforcement learning algorithms to solve previously unsolvable problems wherein reward signals are sparse, meaning that intelligent exploration is required. Go-Explore solves Montezuma's Revenge, considered by many to be a grand challenge of AI research. I will also very briefly summarize a few other machine learning projects from my career, including our PNAS paper on automatically identifying, counting, and describing wild animals in images taken remotely by motion-sensor cameras. Biography: Jeff Clune is the Loy and Edith Harris Associate Professor in Computer Science at the University of Wyoming and a Senior Research Manager and founding member of Uber AI Labs, which was formed after Uber acquired a startup he helped lead. Jeff focuses on robotics and training deep neural networks via deep learning, including deep reinforcement learning. Since 2015, a robotics paper he co-authored was on the cover of Nature, a deep learning paper from his lab was on the cover of the Proceedings of the National Academy of Sciences, he won an NSF CAREER award, his deep learning papers were awarded honors (best paper awards and/or oral presentations) at the top machine learning conferences (NeurIPS, CVPR, ICLR, and ICML), he was an invited speaker at five ICML and two NeurIPS workshops (including the NeurIPS Deep Reinforcement Learning Workshop), and he was invited to give a forthcoming ICML tutorial. His research is regularly covered in the press, including the New York Times, NPR, NBC, Wired, the BBC, the Economist, Science, Nature, National Geographic, the Atlantic, and the New Scientist. Prior to becoming a professor, he was a Research Scientist at Cornell University and received degrees from Michigan State University (PhD, master's) and the University of Michigan (bachelor's). All current and prospective students are invited to attend. Learn about our classes, ask questions about our minor programs, and meet our faculty. We'll have snacks from Porto's Bakery to enjoy with coffee and tea, and advisers will be available to answer questions about course planning and how to declare minors! Stop by whenever you are able to. No RSVP required. Abstract: The risk posed by software bugs has increased significantly as software is now essential to many areas of our daily lives. Runtime verification can help find bugs by monitoring program executions against formally specified properties. Over the last two decades, tremendous research progress has improved the performance of runtime verification. However, there has been very little focus on the benefits and challenges of using runtime verification during software testing. Yet, testing generates many executions on which properties can be monitored. In this talk, I will describe my work on studying and improving runtime verification during testing. My large-scale study was the first to show that runtime verification during testing is beneficial for finding many important bugs from tests that developers already have. However, my study also showed that runtime verification still incurs high overhead, both in machine time to monitor properties and in developer time to inspect violations of the properties. Moreover, all prior runtime verification techniques consider only one program version and would wastefully re-monitor unaffected properties and code as software evolves. To reduce the overhead across multiple program versions, I proposed the first evolution-aware runtime verification techniques. My techniques exploit the key insight that software evolves in small increments and reduce the accumulated runtime verification overhead by up to 10x, without missing new violations. Abstract: Optimization and sampling are both of central importance in large-scale machine learning problems, but they are typically viewed as very different problems. This talk presents recent results that exploit the interplay between them. Viewing Markov chain Monte Carlo sampling algorithms as performing an optimization over the space of probability distributions, we demonstrate analogs of Nesterov's acceleration approach in the sampling domain, in the form of a discretization of an underdamped Langevin diffusion. In the other direction, we view stochastic gradient optimization methods, such as those that are common in deep learning, as sampling algorithms, and study the finite-time convergence of their iterates to an invariant distribution. Joint work with Xiang Cheng, Niladri S. Chatterji, and Michael Jordan. Biography: Peter Bartlett is a professor in the Computer Science Division and Department of Statistics and Associate Director of the Simons Institute for the Theory of Computing at the University of California at Berkeley. His research interests include machine learning and statistical learning theory. He is the co-author, with Martin Anthony, of the book Neural Network Learning: Theoretical Foundations. He has served as an associate editor of the journals Bernoulli, Mathematics of Operations Research, the Journal of Artificial Intelligence Research, the Journal of Machine Learning Research, and the IEEE Transactions on Information Theory, and as program committee co-chair for COLT and NIPS. He was awarded the Malcolm McIntosh Prize for Physical Scientist of the Year in Australia in 2001, and was chosen as an Institute of Mathematical Statistics Medallion Lecturer in 2008, an IMS Fellow and Australian Laureate Fellow in 2011, and a Fellow of the ACM in 2018. He was elected to the Australian Academy of Science in 2015. Abstract: The problem of Stochastic Optimal Control is ubiquitous in Robotics and Control since it is the fundamental formulation for decision-making under uncertainty. The answer to the problem can be computed by solving an associated Dynamic Programming (DP) problem. Unfortunately, the DP paradigm is also synonymous with the infamous "Curse of Dimensionality (COD)", a phrase coined by the discoverer of the Dynamic Programming paradigm, Richard Bellman, nearly 60 years ago, to capture the fact that the computational complexity of solving a DP problem grows exponentially in the dimension of the state space of the problem. In this talk, we will introduce a newly discovered paradigm in stochastic optimal control, called Decoupling, that allows us to separate the design of the open and closed loops of a stochastic optimal control problem with continuous control space. This "Decoupled" solution allows us to break the COD inherent in DP problems, while remaining near-optimal, to third order, to the true stochastic control. The implications of the Decoupled design are examined in the context of Model Predictive Control (MPC) and Reinforcement Learning (RL). We shall introduce two algorithms, called the Trajectory Optimized Perturbation Feedback Control (T-PFC), and the Decoupled Data based Control(D2C), for the MPC and RL problems respectively. We shall also examine the consequences of the decoupling principle in partially observed/ belief space planning problems and present the Trajectory optimized Linear Quadratic Gaussian (T-LQG) algorithm. Biography: Suman Chakravorty obtained his B.Tech in Mechanical Engineering in 1997 from the Indian Institute of Technology, Madras and his PhD in Aerospace Engineering from the University of Michigan, Ann Arbor in 2004. From August 2004- August 2010, he was an Assistant Professor with the Aerospace Engineering Department at Texas A&M University, College Station and since August 2010, he has been an Associate Professor in the department. Dr. Chakravorty's broad research interests lie in the estimation and control of stochastic dynamical systems with application to autonomous, distributed robotic mapping and planning, and situational awareness problems. He is a member of AIAA, ASME and IEEE. He is an Associate Editor for the ASME Journal on Dynamical Systems, Measurement and Control and the IEEE Robotics and Automation Letters. Graduate students are invited to come along to this month's GSBME Game Night, in conjunction with the Graduate Association of Students in Physics. Bring along your board games and enjoy free food from Papa Cristo's. Speaker: Kenton Murray, Notre Dame Univ. Abstract: In recent years, Neural Networks have reached state-of-the-art performance in a variety of NLP tasks, including Machine Translation. However, these methods are very sensitive to selecting optimal hyperparameters. Frequently this is done by large scale experimentation often through grid or random searches. However, this is computationally expensive and time consuming. In this talk, I will present a few methods for learning hyperparameters during the training process. Thus, instead of training multiple networks with different hyperparameters, we only need to train one network without large grid search experiments. Our methods yield comparable, and often better, results, but at a faster experimentation rate. Biography: Kenton Murray is a 5th year PhD Candidate at the University of Notre Dame working with David Chiang on methods for improving Neural Machine Translation for Low Resource and Morphologically Rich Language Pairs. Prior to ND, he was a Research Associate at the Qatar Computing Research Institute focusing on Arabic Machine Translation. He holds a Master's in Language Technologies from Carnegie Mellon University and a Bachelor's in Computer Science from Princeton University. LAST GRAMMAR TUTORIAL OF THE SEMESTER! BME faculty and students are invited to this introduction to the BME Maker Lab, a space for students to develop independent projects, to innovate and test ideas for biomedical devices and products. The facility is primarily for mechanical and electronic fabrication and testing, and will function as a gathering place for students to formulate ideas. The lab is aimed at undergraduate students, as well as graduate students who are also interested in working out independent projects, outside of their research. For further information about the BME Maker Lab, contact Jean-Michel Maarek at maarek@usc.edu. 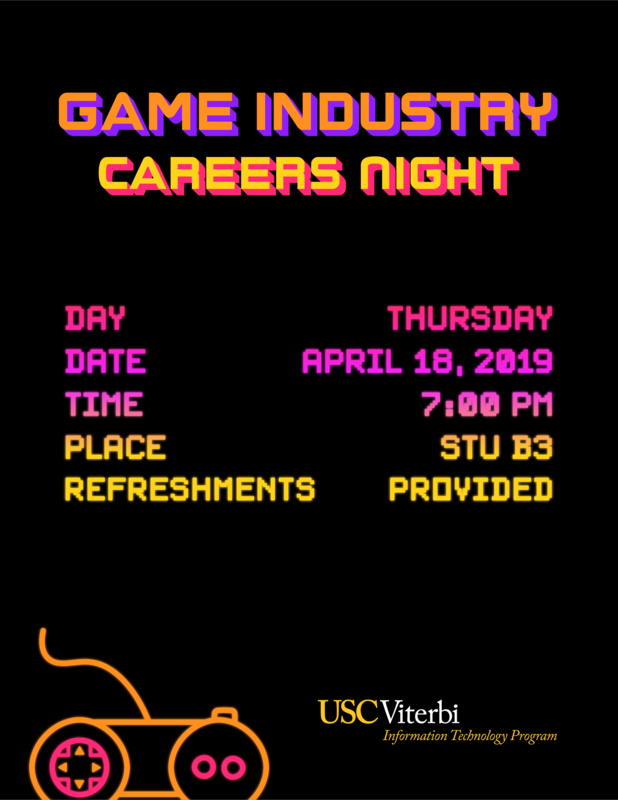 Join us for an exciting night of discussion about careers in the video game industry! Game programmers, level designers, producers, and consultants will be a part of our career panel. We hope you are able to join! All students are invited to attended. This event will be on Thursday, April 18, 2019 at 7p.m. in STU B3 at the USC Career Center. No RSVP required. Refreshments will be provided. This event is hosted by the Information Technology Program and is organized by Professor Tom Sloper. Professor Sloper brings his experience at Activision, Sega, Atari, and Yahoo to teach courses in video game design, production, and management at the Information Technology Program.